Avast, scalawags! Here be questions and answers to many of the more common questions we be asked here at Blackbeard for Men. If ye don’t see the answer to yer question here, please send us a message in a bottle by using our CONTACT FORM, and we be getting back to ye promptly. Blackbeard for Men is patented, water-resistant brush-on hair color specially designed for men’s facial hair. It is NOT a dye! It can be used on its own to touch up gray patches in your beard, mustache, sideburns and eyebrows, or even to touch up your roots if you use a dye and don’t want to deal with the enormous hassle of re-applying the dye. Arr! Do you have any tips for how to use Blackbeard for Men? Do you have any tips for how to use Blackbeard for Men? Yep! 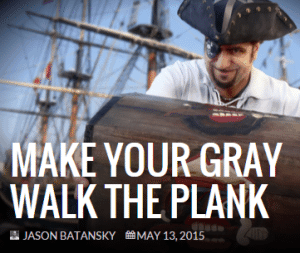 See our TIPS page for the best ways to apply and use Blackbeard for Men. Yes! Blackbeard for Men has a 100% Risk-Free Guarantee. First-time customers may return the unused portion of their order for any reason and receive a full refund including shipping and handling. The request must be made within two weeks (14 calendar days) of purchase. To return an item, please contact customer service via our form – click here. Returns should be sent to: Attn: Returns Blackbeard for Men 3651 S. La Brea Ave #522 Los Angeles, CA 90016 Please allow two weeks to process your refund. Maximum refund: 3-pack. Is Blackbeard for Men safe to use? Blackbeard for Men is hypoallergenic and non-toxic when used as directed. It was developed with a leading manufacturer of hair care and cosmetics products. The formulation uses only the finest approved and well-established colorants used safely for decades in other products around the world. 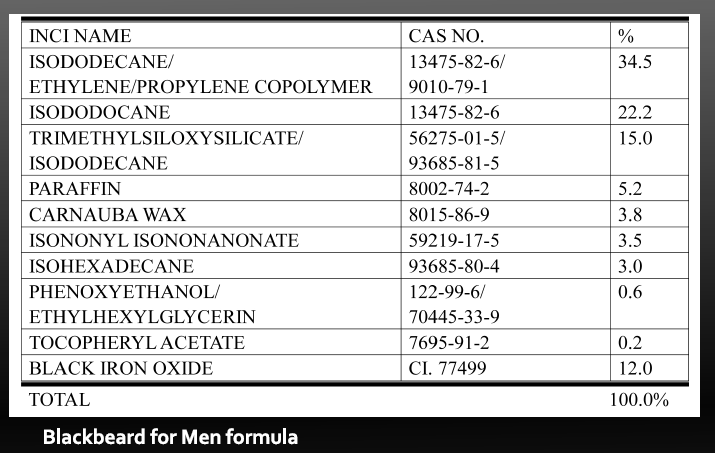 Blackbeard for Men has been independently safety tested by TUV Rheinland Laboratories, who pronounced Blackbeard for Men "safe when used as intended and under circumstances involving reasonable foreseeable misuse according to U.S. Federal Hazardous Substance Act (FHSA) Regulations and U.S. Food and Drug Administration (FDA) Regulations for Cosmetic Products." As well, it has been tested and certified 100% mercury-free. Blackbeard for Men is not a dye, so it is ideal for people who are sensitive to the harsh chemicals in dyes. Most people who are unable to use dyes are able to use Blackbeard for Men. However, some people do have skin allergies or certain sensitivities. If you experience any discomfort or symptoms such as skin rash, itching or dry skin, discontinue use of Blackbeard for Men immediately and consult a physician. Will Blackbeard for Men rub off? We’ve designed Blackbeard for Men Formula X to be resistant to smudging, so you can wipe your mouth with a napkin while eating and not worry about wiping away all the product. That said, a certain amount of Blackbeard for Men will fade or could wipe off with aggressive rubbing or face-washing. Blackbeard for Men is not permanent color like dye and does begin to fade after appx. 8 hours wear (or more.) It may be wise to carry a bottle around for touch-ups as needed, just in case. Certain activities produce more wear and tear on the product. For example, surfing – after being out in the sun and salt water for a few hours, your Blackbeard for Men will have faded a bit (but will still look natural.) Note that Blackbeard for Men may stain some fabrics. Wash with soap and cold water. Wash it off completely in the shower or else some residue may rub off on your towel after a shower. And wash it off before bed if you use light-colored sheets. Will my friends know I’m using Blackbeard for Men? No. When applied properly, Blackbeard for Men looks absolutely natural. Some friends may not even realize how your appearance has changed. They may stare at you for a while trying to figure out what’s up, but may not even be able to put their finger on the difference! How long will a bottle of Blackbeard for Men last? How long does Blackbeard for Men take to put on? Goes on in seconds. Just brush it on. That’s it! How long does Blackbeard for Men last when applied? Blackbeard for Men is not a dye. It is a patented brush-on topical colorant. As such, it is less likely to cause an adverse reaction than some dyes, which often use harsh chemicals. Blackbeard for Men goes on instantly. Unlike the leading men’s facial hair color product, Blackbeard for Men brushes on in seconds and you’re ready to go. Dries quickly, too! Using the leading men’s facial hair color product is a time-consuming, annoying process. Blackbeard for Men has no harsh chemical odor. The leading men’s facial hair color product has a bleach component which smells awful, and worse, you must tolerate it for several minutes. With that product you are in fact dyeing your facial hair. Blackbeard for Men is not a dye, but rather, it is a topical colorant. Blackbeard for Men fills gaps. It doesn’t just color the existing hair – it can color skin, too. This can be very helpful for those of us whose facial growth is a bit more spotty. Finally you can have that full beard or mustache look! Blackbeard for Men is more economical. The leading men’s facial hair color product gives you three applications per box. The gray hair never stops growing, which means the gray will be visible again after only a day or two! Within just a few days the colored facial hair will have grown out enough so that you have obvious gray roots. Blah! You would have to buy a ton of the stuff and apply it every other day. That would cost you a fortune and take a ridiculous amount of time. With average use, each bottle of Blackbeard for Men lasts about a month. You don’t have to lose ALL the gray! Unlike the leading men’s facial hair color product, Blackbeard for Men is not a dye or bleach and isn’t “all or nothing.” You apply it to where YOU want to apply it. If you want to leave a little bit of gray for a more natural look, go for it! See our TIPS page for helpful hints on how to do this. What are the benefits of using Blackbeard for Men? Look younger instantly! Users of Blackbeard for Men report chopping a decade or more off their appearance in seconds. Check out our before and after pix and see for yourself! Self-confidence. Proceed boldly, knowing that the world perceives you as younger and more dynamic. You only live once. Make the most of it! With Blackbeard for Men, you’ll know that the world perceives you differently – better, stronger, faster. More opportunities for employment/advancement. Unfortunately, ageism is very real. In many fields, youth is valued while age and experience are treated with derision. If you’re looking for a job and you have a gray mustache or beard, unless you’re at the executive level, the deck is heavily stacked against you. Blackbeard for Men helps you even up the odds. Is Blackbeard for Men easy to use? Arr, you bet, matey! Application time is about 40 seconds. You just brush it on. If ye accidentally apply too much or get some on your skin, just wipe it off with a tissue. If ye want to leave a little gray for a natural look, go fer it. Blackbeard for Men Formula X dries in about a minute or so. Will my shipment be confidential? For shipments within the USA, we ship in plain envelopes with "BBFM" and our return address. In other words, plain, unmarked packaging! Unfortunately, for foreign shipments we must complete a customs form which is attached to the parcel, identifying the contents. This is usually pretty hard to read by the time it arrives, but still, alas, we cannot say that the packaging is unmarked. Also, Blackbeard for Men will NEVER sell your name or e-mail to anyone for any reason. Is Blackbeard for Men patented? 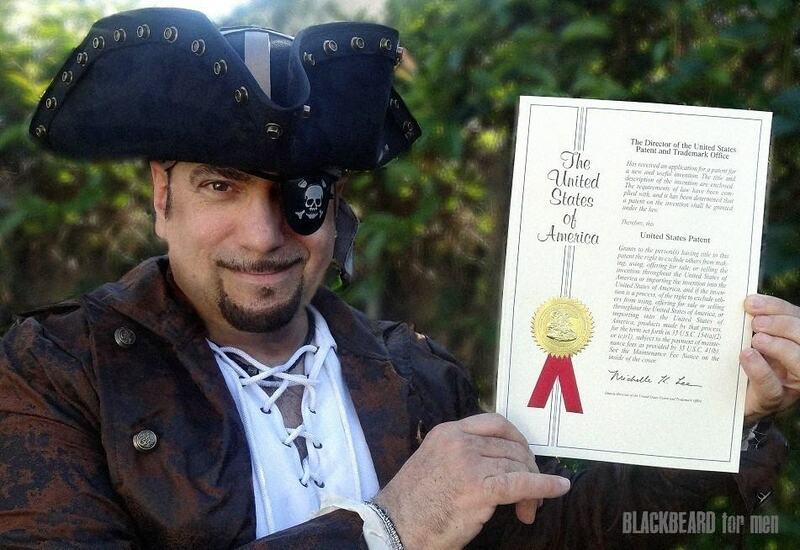 Blackbeard for Men has a non provisional utility US patent. The patent number awarded is 8679467. If you wash your face if it will come off? Does it stain your skin? Blackbeard for Men be water-resistant. So if ye wash gently, it should stay on pretty well. However, if ye scrub hard with soap and water, it will come off. It is also resistant, but not impervious, to rub-off. In other words, if you blow your nose with a tissue or wipe your face with a napkin, it should hold pretty well. But if you wipe hard, it will come off. Blackbeard for Men does not stain your skin like, for example, a permanent marker. It will color skin if you apply it there, but it is only surface-deep, and you will always be able to remove it completely if ye want. This makes it very effective at filling gaps. Is Blackbeard for Men good for stubble beard? Aye! Recommend wiping off most of the product on the lip of the bottle and then apply using the side of the brush, very lightly. Then use a tissue to tamp the color down and blend as necessary to create an overall stubble look that also fills gaps.